What Do the Colors and Symbols of the Flag of Colombia Mean? All about the flag of Colombia - facts, symbols, history, and more. The official flag of Colombia. The current flag of Colombia was officially adopted on December 17, 1819. Colombia's flag is solid stripes of blue, yellow, and red. The flag features three horizontal bands of yellow (double-width), blue and red. Colors of the flag are commonly interpreted in two ways. One version indicates that the yellow symbolizes sovereignty and justice, blue as loyalty and vigilance, and red represents the valor shown and the victory achieved during the battles for independence from Spain. A very popular children's song claims that yellow represents the gold Colombia once owned until the arrival of the Spanish, blue indicates the country's contact with two oceans and red represents the blood that Colombians spent in their struggle for independence from Spain. 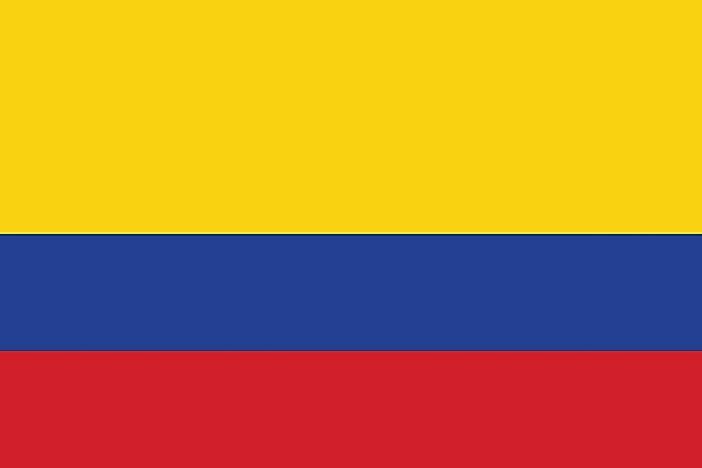 The official flag of Colombia consists of three horizontal stripes of yellow at the top, blue at the center, and red at the bottom. The yellow stripe at the top occupies half of the flag while the other two occupy the other half equally. It is locally known as the National Tricolor. The original version was adopted in 1806 but it was not until on November 26, 1861 that the current version was made the official national flag. The three colors of the flag are similar to the colors used by the Gran Colombia, a short-lived republic that collapsed in 1830. The flags of Colombia, Ecuador, and Venezuela share the same colors in a similar order although various additions differentiate the flags. The three countries all adopted the colors of the Gran Colombia that was designed by Francisco de Miranda. He was inspired by the colors of the Burger Guard of Hamburg he had come across during one of his expeditions in Germany. As the British planned to liberate Spanish America in 1901, he submitted ten versions of a proposed flag with the three colors to the cabinet although they were all rejected. On March 12, 1806, he raised the yellow-blue-red flag on a hired ship during his expedition to Venezuela marking the first use of the flag as a national symbol. In 1831 the Gran Colombia collapsed and Colombia became part of Republic of New Granada. Its official flag consisted of vertical stripes of red, blue and yellow. In 1861 the country officially adopted the current flag as its official flag. In 1925, Colombian president Pedro Nel Ospina declared August 7th a national flag day to mark the victory of the Freedom Army against the Spanish colonial army on August 7, 1819. The flag is hoisted on all Colombian official offices including overseas embassies on July 20th to mark the country’s Independence Day. The same is done on August 7th, October 12th, and November 11th to mark Battle of Boyacá Day, Race Day, and Cartagena’s Independence Day respectively. The flag should be raised from 8am-6pm and it should never make contact with the ground or be raised at night.